dive bar sundae. – recipes from the birdcage. I don’t play an instrument, nor do I sing very well. I do, however, like to create dishes that are inspired by things. This dive bar sundae is my interpretation of, um, a dive bar. Pretzel Streusel = because pretzels and beer just go together. Salty, malty, etc. Coffee Ice Cream = there are a variety of coffee infused beers out there, but I incorporated coffee ice cream because it reminded me of the morning after a night in a dive bar. Hung over? Yep. Gonna need that coffee please. Smoked Imperial Stout Caramel = Imperial Stout was used because of its maltiness, creaminess, and “velvety mouthfeel” (which is what the back of the bottle said). 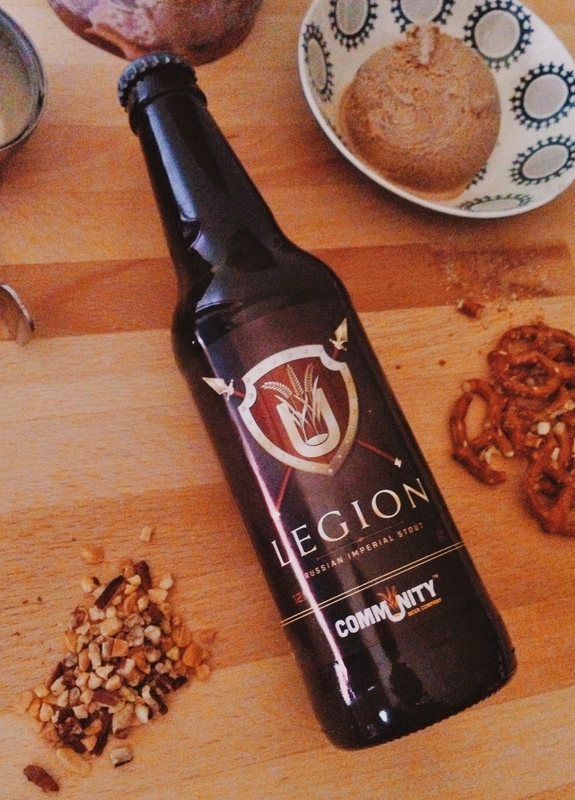 The beer I used is from Community Beer, based out of North Texas, and was a Russian Imperial Stout called Legion. The smoke, of course, was inspired by the concept of a smoke-filled bar and I used a smoked, black sea salt I had purchased on my most recent trip out to LA. You can find it here, but any smoked sea salt will likely “work” in the caramel recipe. Beer nuts = This one is obvious….but on a side note, am I alone in being creeped out by a bowl of nuts that every sweaty-palmed intoxicated person in the bar digs around in? I used a combo of toasted peanuts and added pecans. Each component can be made ahead up to five days before assembling the sundaes. The Smoked Imperial Stout can be a little fussy to make; it is caramel after all. The other ingredients? Super easy. I just picked up a pint of coffee ice cream from the store. Let’s not over complicate things, right? 2. Melt and cool butter in a large, microwave safe bowl. 3. Roughly crush pretzels with your hands. Don’t worry about the pieces being uniform in size. Just give them a good squeeze and dump into melted butter. 4. Add remaining ingredients and toss to coat. 5. Spread out on a parchment lined baking sheet and bake for 20 minutes, stirring every five minutes or so. 6. Let cool. Pretzel Streusel will stay in a tightly sealed container up to one week. ***the bubbles in the beer cause this to bubble more than a standard caramel sauce. Please use caution and a large pan/pot with deep sides. To reduce the chance of boil-over, allow beer to sit out and go flat or you can boil a cup of beer for a few minutes to de-gas it; measure out your 1/4 cup and proceed. 2. Once the sugar granules are fully dissolved, let syrup boil lightly until 250 degrees (soft ball stage)when measured on a candy or instant read thermometer. 3. Stir in butter with a whisk, taking care. Butter will cause the caramel to rapidly bubble up and is extremely hot. 4. Pull pan off stove. Stir in heavy cream and smoked sea salt until incorporated. Pour caramel into a heat proof jar. Cool slightly. Allow to thicken in the refrigerator several hours. 1/4 cup of chopped peanuts, pecans, or a combination. Toasted or untoasted, your call. 1. In a bowl, place handful of Pretzel Streusel. Scoop ice cream on top. 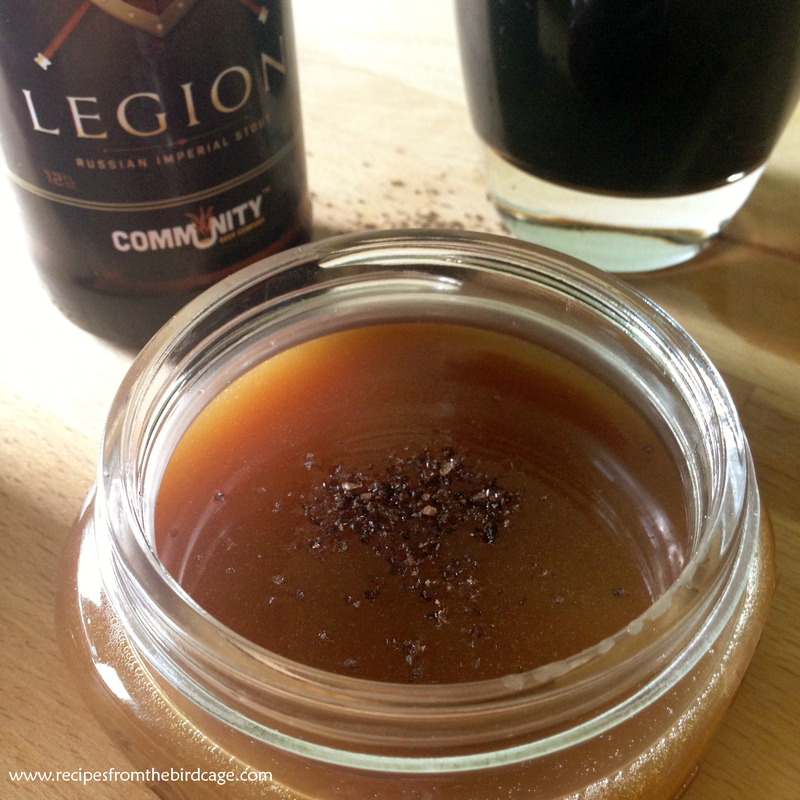 Generously drizzle Imperial Stout Caramel Sauce. Top with sprinkling of nuts. Voila!